Hyner View at the top of Humble Hill looking down at the valley, 1400 ft below! 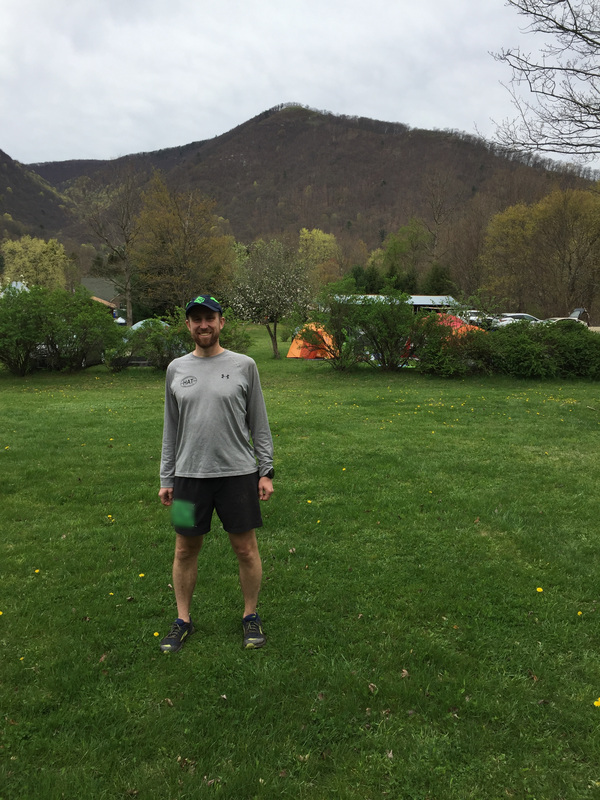 This last weekend I went to central Pennslyvania for the 2017 Hyner View Trail Challenge. My goal was to have my 2006 Dodge Sprinter Van “Smokey” ready to go for an adventure, but alas, the check engine light came on a couple of days before the race. There have been a lot of issues with this van that I’ll detail in other articles and posts as I build out the Sprinterventurer.com website. Instead, my buddy and I took his Subaru Crosstrek. 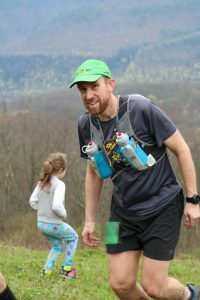 The Hyner View Trail Challenge is a trail race with two options, 50K and 25K. 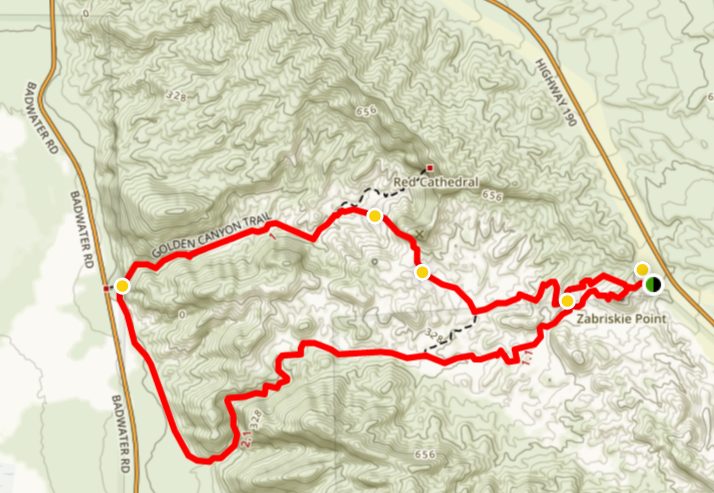 The 25K has three significant climbs of about 1400ft each, totaling 4300 ft of elevation gain over 16 miles. My buddy did the 50K, which adds two more climbs and double the distance with total elevation gain of 7500 ft. There was a lot of rain in the days before the race, and that resulted in many stream crossings. In some places, the streams overflowed their banks and cascaded down the trail! There was so much slogging through water that I was unable to feel my feet for a while. Eventually, things dried out, and I saw people changing into dry socks at an aid station. Two minutes later, we were slogging through the water again! Oops. Here is a video of the race by Rosser Runs, where you can see the slogging through water and the big hills. As you can see in the video, this is not a race for the faint of heart. There is a reason they call it Beast Coast Running! You need to be prepared. 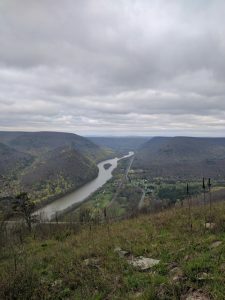 We trained on the largest local hills we could find, like Maryland Heights in Harper’s Ferry West Virginia, and Bob’s Hill in Cunningham Falls State Park in Maryland. Hyner View Trail Challenge campground post-race, after most people left. You can see Humble Hill behind me, with Hyner View at the top of the hill. It’s a 1400 ft climb. Hyner is a beautiful area. You can camp just feet from the Start / Finish, or across the road at an airfield. We heard there was a good party at the end of the race, and it mostly did not disappoint. I say “mostly” because yes, there were free and delicious draft microbrews from Yorkholo Brewing Company in nearby Mansfield PA, and it was plenty fun until the last stragglers heaved themselves over the finish line. Then everyone packed up, and our camping area decamped en masse. There were only a couple people left! Some party! We later found out that the people socializing were over at the airfield. The airfield is also where you can park vans, RV’s, and trailers. So here we were, by ourselves, but we had the forethought to have cold beer in the cooler, and we brought a portable firepit and firewood! We fired it up and enjoyed it for a while, and then a couple that had gone out for dinner returned to their campsite and joined us for a while. So we did learn that if you want to be social at a campsite, having a fire is important. 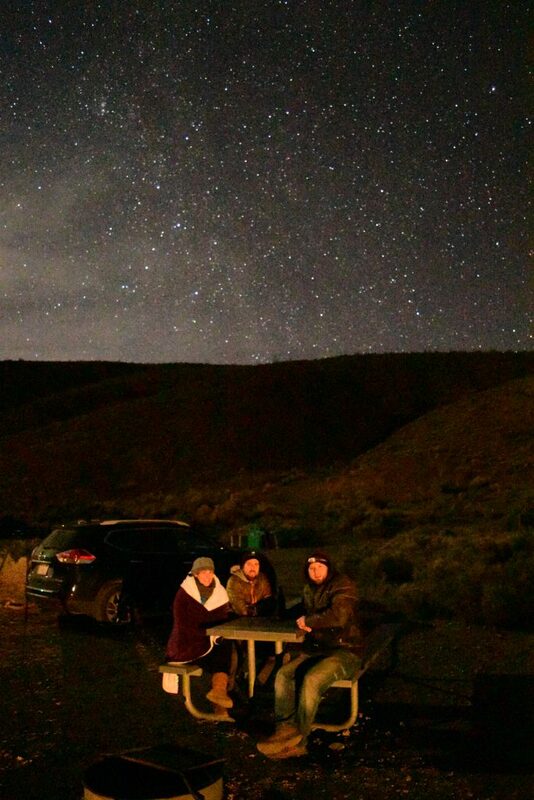 Once when I was camping in Colorado, there was a group of college kid stoners in the next campsite, and they said: “Without a campfire, you’re just chilling in the dark.” I’m pretty sure they were talking about me because I was indeed “chilling in the dark” looking at the stars. Pro tip: If you don’t want to camp, you can stay in Williamsport, PA which is a bit less than an hour away but it has the advantage of being the home of Bullfrog Brewery, which has delicious microbrews and excellent food. Many vegan options if you are into that kind of thing. Lock Haven PA is only 30 miles away and is a college town, so I’m sure they have good stuff there, too, but I have not yet stopped there. I finally make it up Humble Hill to Hyner View, and kids are running around like it’s NBD! Haha. Update: Hyner View Trail Challenge 2018 registration went live yesterday, and it was selling fast. I signed up for the 50K next year! I need to make sure I get in plenty of long runs, hills and stairclimber, get in front of the slowest part of the conga line going up Humble Hill, and most importantly, I need to get Smokey the Dodge Sprinter adventure van working reliably!!! We are camping in the airfield in 2018. 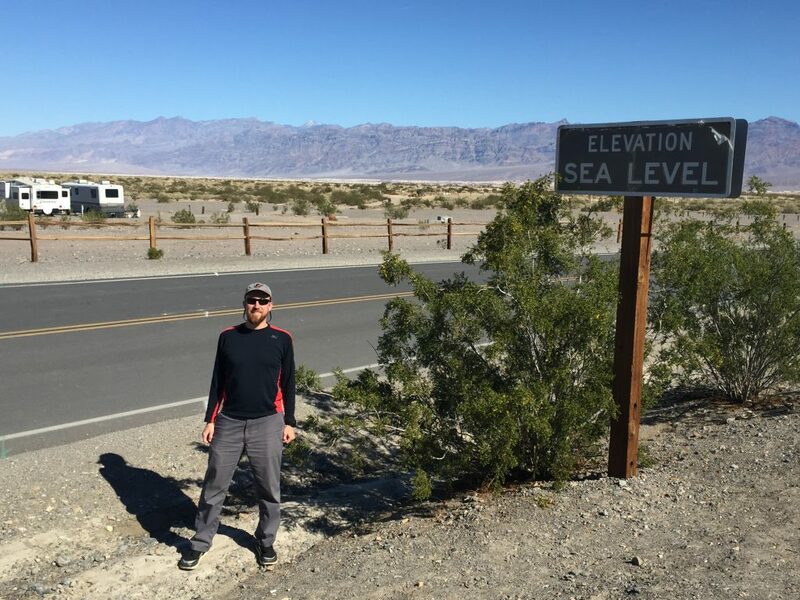 At Stovepipe Wells in Death Valley National Park, there’s a sign that reads “Elevation: Sea Level.” The road descends beyond the sign! I loaded up google maps with my destination, and I was off! I’m not sure of the actual route I took, but it’s about 300 miles and roughly 5.5 hours. I saw signs for a toll road in Southern California near LA, but I figured, ok, I’ll just stop at the toll plaza like I do in Kansas, and I’ll be on my way. There were no toll plazas to pay! You either have a transponder like (but not compatible with!) the EZPass we have on the East Coast, or they take a picture of your license plate. You have 5 days to find their website and pay. For visitors not from the area, it is a huge hassle. Death Valley has poor to no cell signal, which complicated things. Once you find the website at thetollroads.com, you have to guess what roads you were on (it doesn’t tell you). After spending about 20-30 minutes trying to figure out what roads and exits I took, I saw a message that said the first time you use the service, you can just wait and they will snail mail a bill to you. I opted for that. Once I got home, I looked at the bill and it was for a somewhat reasonable $6. But if I didn’t pay it right away, it would have been $206! If you take this option, make sure you take care of the bill somehow before they hit you with the $200 fine. If I spend more time in SoCal, I will either try to avoid the toll roads or sign my vehicle up for their toll system. There are three tiers of pricing and convenience, transponder, license plate photo, or pay as you go. But the byzantine SoCal toll system is not what this article is about! After the toll road debacle, I got further and further away from the metropolis, signs of civilization and the signs of life in general, got increasingly spread out until they disappeared entirely. The light of day was fading at the same time. The condition of the roads also got increasingly worse. Eventually, things got so remote that I would only see another car every 30 minutes or so. There was a desolate intersection at Trona Wildrose Rd and Panamint Valley Rd that normally would lead to Wildrose Campground, but a few days prior when I was in San Diego, the Death Valley and all of SoCal for that matter, got record rainfall. That’s a big deal for an area that typically gets only 2″ of rain per year! The rain washed out the road I was going to use, so I had to go the long way around. I just checked two months later, and the road is still closed! I’m mentioning this because when going into remote areas, it is very important to check road conditions ahead of time, bring plenty of water, food, tell someone where you are going (a rule I don’t always follow, but I should! ), and most importantly, fill up with fuel. In remote areas like this, you can go a hundred miles between fuel stations. When going to a remote campground like Wildrose, you have to have enough fuel to get there and back to the next gas/diesel stop. I think I filled up at Searles Valley. It’s almost 100 miles to the campsite, and my car can only go 250 miles on a tank. I got increasingly nervous as I navigated Death Valley at night, climbing up the remote roads to the campsite. I almost turned around a few times, as I wasn’t sure if I was going to have enough fuel. I eventually decided to take the risk and I kept going. Later on, I found out that Panamint Springs had fuel, as well as Stovepipe Wells and the park headquarters village. The prices can be quite a bit different at each location. Like more than a dollar per gallon different. I saw several people pull up, react with shock to the price of gasoline, and then keep going. It was funny because Stovepipe Wells had some of the cheaper gas. I can only imagine what those people did when they got to the Park HQ and saw it was a dollar per gallon more! Did they come back to Stovepipe? Exit the park? Who knows. I digress from the story. There are signs that say that the road up into Wildrose Campground is limited to vehicles of about 25ft or shorter. There are a few tight turns with solid rock walls on either side. No large RVs. It was very very dark, and a bit spooky. The road kept climbing and climbing, I stopped a few times to look at the amazing night sky and decide if I was going further. Eventually, I saw the sign for Emigrant Pass at 6,125 ft and knew that it wasn’t too much further. I was still nervous about running out of gas, so I walked over to a neighboring campsite and asked the kind camper there if she knew where the closest fuel was. She pulled out a map that was way more detailed than mine, and she showed me a couple places that were within 30 miles. We chatted for a while, she introduced me to another camper who she just met the day before, and we all agreed to return to the campsite that evening. Who knew being social could be that easy? As a shy person, I normally have difficulty connecting with people. First stop in the morning was Stovepipe Wells, which has a restaurant, saloon, General Store, campground for RVs, a motel with pool! and gasoline and diesel. I’m pretty sure they only have one octane rating, so if you have a fancypants high-performance vehicle, it might knock a bit until you get some higher octane gas. They also have cell service, so I sat on a rocking chair out in front of the store on their shaded porch, handling my communications chores. I actually spent a good amount of time there, and then all of a sudden, a stabbing heat hit my nether regions, and I got really worried for a second until I noticed that even though I was in the shade, the sun was now illuminating that area in question. The sun is VERY strong here! Even in winter. It was so odd, I had to get up and move fully into the shade to verify that it was really the sun causing the pain and not some kind of strange sign of imminent medical catastrophe! 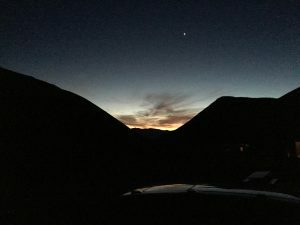 I first heard of Death Valley in Ultrarunning forums, books, and a couple movies. There is a race called the Badwater 135 Ultramarathon. It starts at Badwater Basin, which is the lowest point in North America. The original race course went from Badwater to the peak of Mount Whitney, which is the highest point in the Lower 48 United States. They had to modify the course due to permitting issues, and now the race finishes at the Whitney Portal, which is the trailhead for Mt. Whitney. I’ve heard so much of the race, first from the books Ultramarathon Man by Dean Karnazes, and in Born to Run by Christopher McDougall. 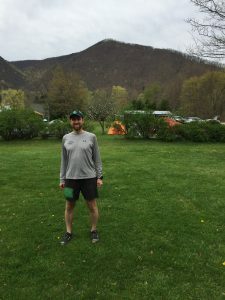 Then from a few movies I’ve seen, and finally, one of my Baltimore running friends has done it more than once, and it was fun reading about it through his Facebook posts. 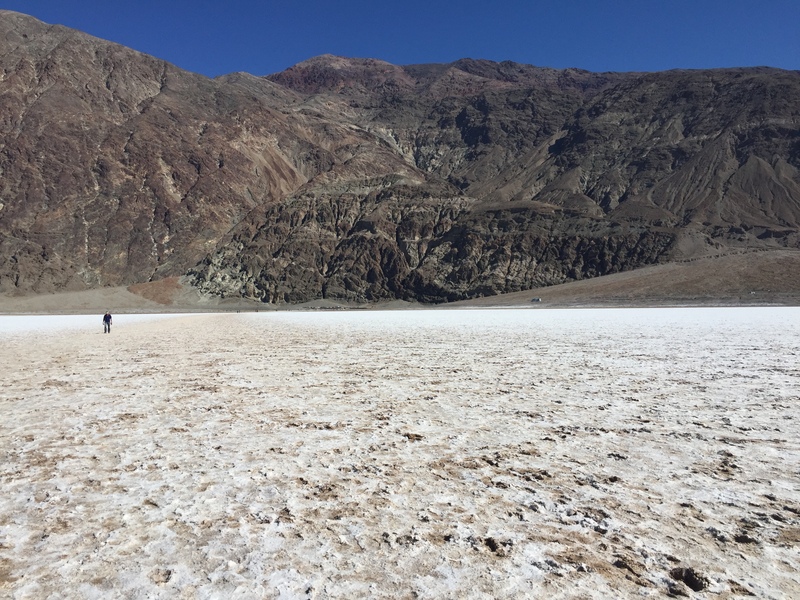 It is a place of some significance to me, so Badwater had to be at the top of my must-see list. In this map, you can see that this park is on a truly large scale. 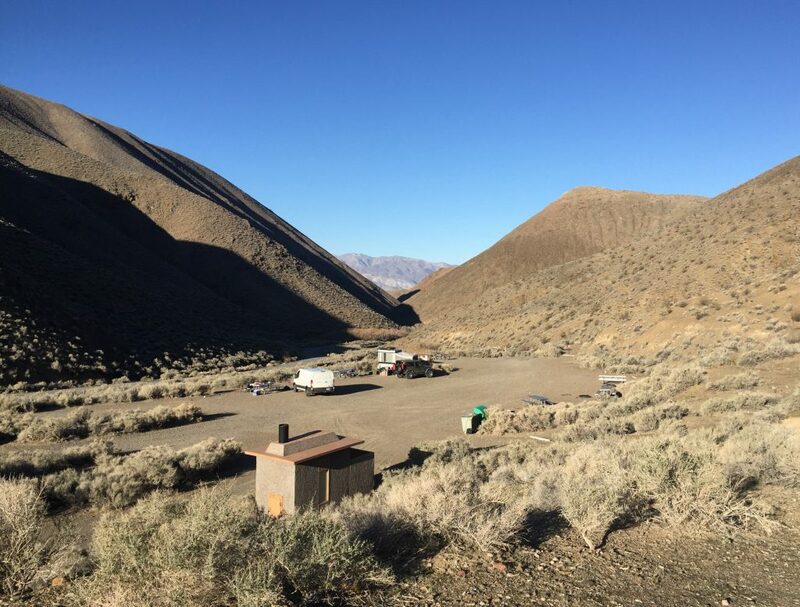 It takes about an hour to drive 30 miles to the General Store and cell coverage: down the 17-mile twisty Emigrant Pass road and then 12 miles of highway just to get to Stovepipe Wells. Note: it is possible you might be able to get signal before that, but probably not until you at least get to the main road. From Stovepipe Wells, it’s another 4o miles and 50 minutes to get to Badwater. That’s almost 2 hours of driving, and you’re just in one part of the park! 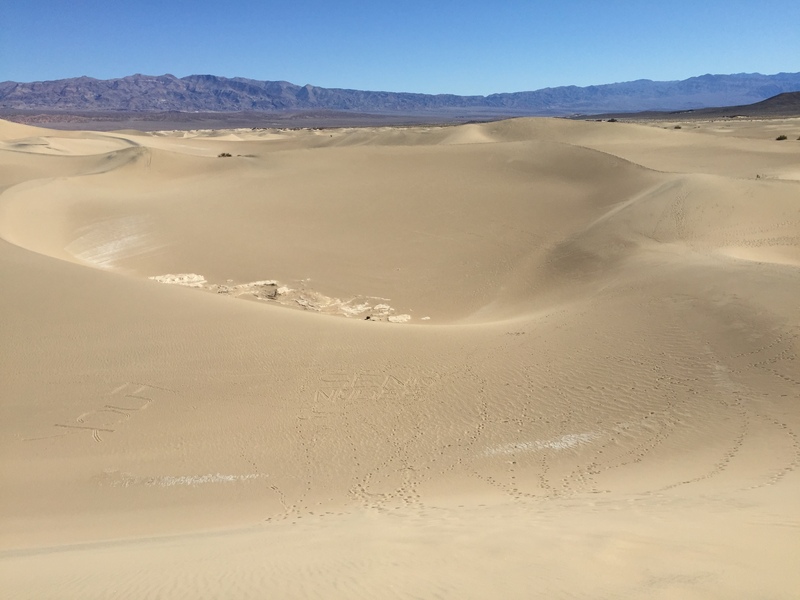 As I sat in Stovepipe Wells, I spied a group of sand dunes nearby, so I resolved to check that out first! 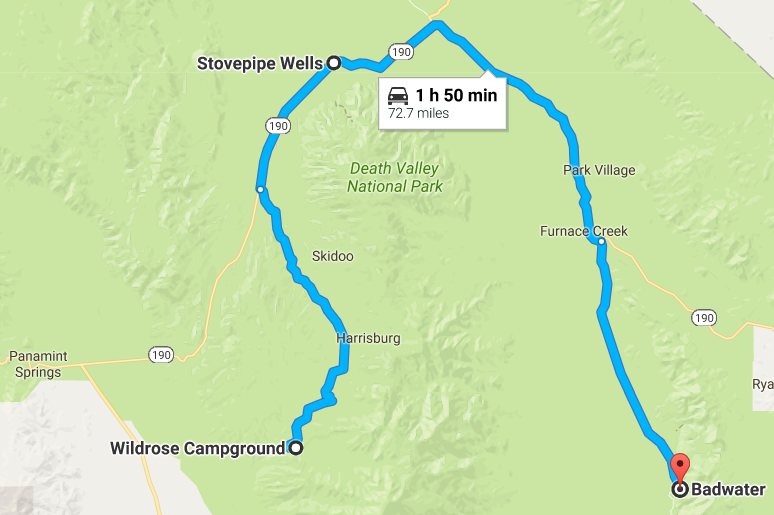 It’s only a mile or two from Stovepipe Wells. 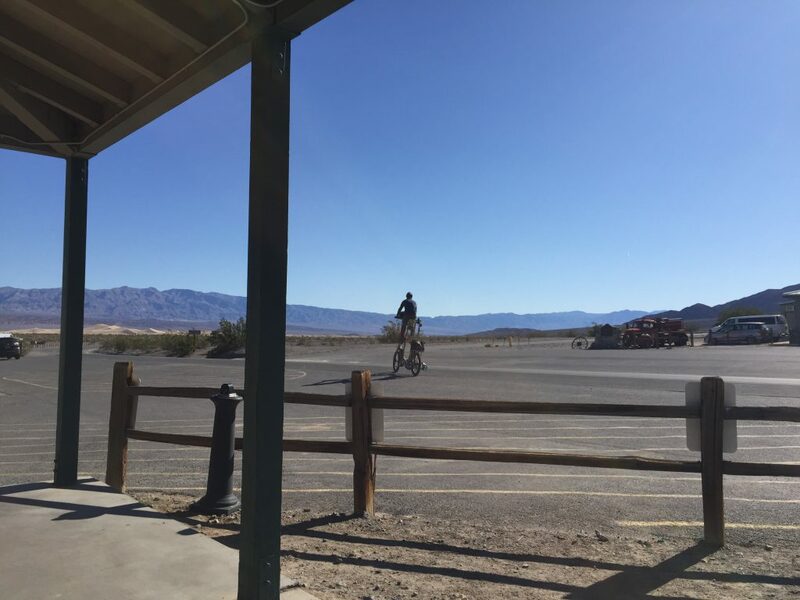 Sitting on the front porch of the General Store at Stovepipe Wells in Death Valley National Park, you can see Mesquite Flat Sand Dunes about a mile away, and a very strange bicycle in the foreground. I’m not having great luck trying to properly display panos here. They look great on Facebook. You can scroll all over the picture. When you take a pano picture, you stand (or sit) in one place, and spin around 360 degrees. It can be a very immersive experience to view, if you have the right software! Oh, well, I can fix this later. “Where’s Waldo?” As I looked through my pictures, I saw this one, and thought, oh, that’s a cool sand bowl surrounded by dunes, but then I zoomed in and saw why I originally took the picture. There’s a castaway-styled message written in the sand if you click on the pic and zoom in. I don’t mind grafitti in the sand, because it resets itself every night like an Etch-a-Sketch. I ran a couple miles here in the sand dunes, got lots of sand in my shoes, and then I had enough playing, it’s time to visit the Mecca of Ultrarunning: Badwater, CA. This is the sign everyone takes a selfie in front of. I should have asked someone nearby to take my picture, but I didn’t. 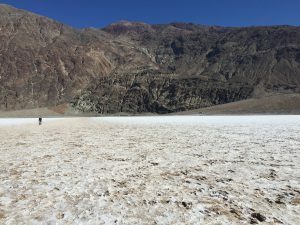 One mile into Badwater Basin salt flat looking back at the parking lot. 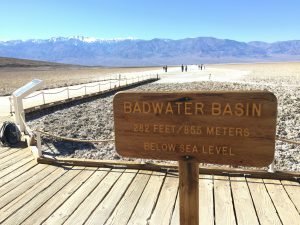 Once I got to Badwater Basin, the lowest point in North America at 282 feet below sea level, I decided to run! You can see the salt flat behind the sign. I just ran about a mile on the salt flat until the trail started to disappear. I didn’t know if I continued if I would be causing some kind of grave ecological disaster, so I turned around. Also of note: It’s so dry here, I drank an entire 20oz bottle of water in the two miles! Even in winter, it is extremely dry. Be prepared. After rehydrating, I decided to hit one more spot that I saw on the drive over. I ran another mile or two at this forgotten canyon, but I was starting to get woozy and hungry, and you really need to know your limitations when in extreme environments. Time to head back to the campsite! Someone took my old spot, so I chose a new campsite and took a glamour shot of Elle. 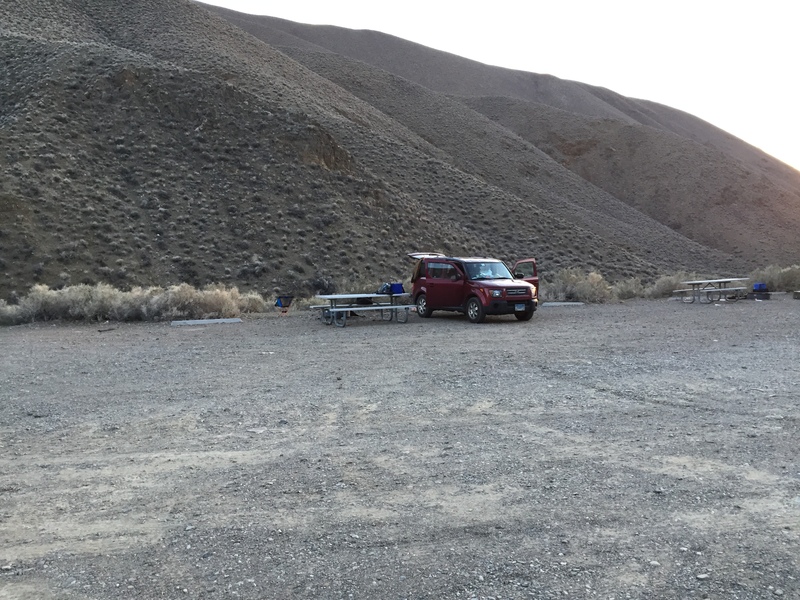 I wanted to make sure I got back to the campsite before dark so I could set up camp and cook some dinner. It can be difficult to find all your gear and get the stove working when it’s dark out. And it gets very dark this far away from civilization. Look below for some night sky photos! Look! I can be social! Hanging out with K and M (not sure if I should use their names or not.) M was playing around with the DLSR camera and set it to long exposure so you can see the stars. We sat perfectly still for 15 seconds so the pic would come out ok! The next morning, I decided I wanted to visit Las Vegas. On my way out of the park, I saw a bunch of people by the side of the road at Zabriskie Point. 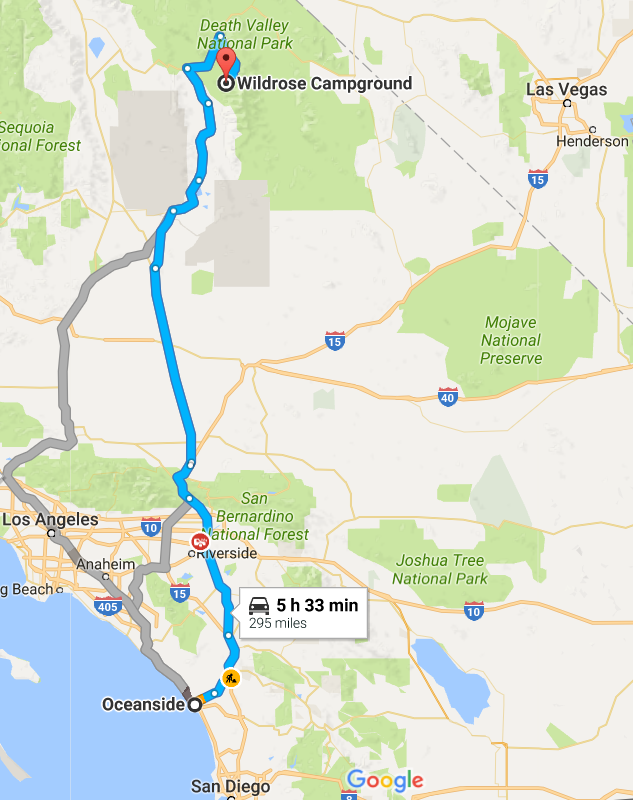 I figured I’d check it out, plus you never know how long it’s going to be before you get to the next rest stop facilities. Once I treked to the Point, and oohed and aahed with the rest of the tourists, I noted the presence of trails winding around the desolate but beautiful landscape. I looked at the map, and saw I could get a 6 mile run/hike in, so I quickly changed into my running gear, filled up 3 x 20oz water bottles, and I was off! At about 100m down the trail, there was a shirtless buff-looking dude who looked like he didn’t bring any water with him and his girlfriend was splashing him with her water. That was an ominous sign. I kept going. There was a crowd of people around, and like I said, it was a very short walk back to the cars. If this had been a remote encounter, I would have stopped to see if I could offer any assistance. If I could do this over again, I would have stopped even though there were people trying to help him already. I need to be more social. And besides, what if that crowd was full of idiots? I might have been able to offer better help. The view from Zabriskie Point. You can see the desolate hills called “the Badlands” in the foreground, and in the distance, you can see the salt flats, and beyond that are the mountains where I camped the last two nights. This was a pretty fun run, the terrain was easy to navigate. On the way back, you are coming up a dry streambed. I should probably know the terms for these things, I think the correct term is a “Wash”. Arroyo or Wadi are also terms sometimes used, depending on where the namer came from. Arroyo is a Spanish term, and Wadi is a North African and Southwest Asian term. Ok, here I am digressing again. When following this dry Wash, it can be hard to follow the trail. I brought 60! 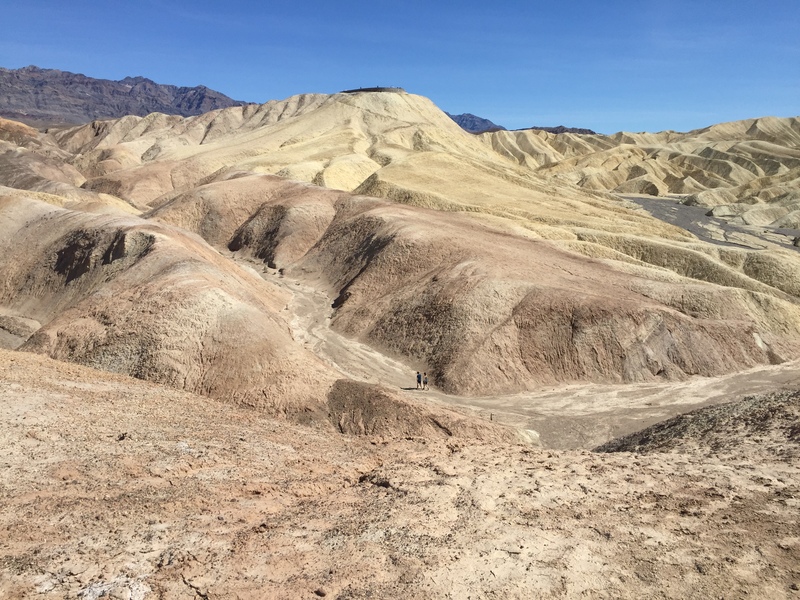 ounces of water with me, and I only had 10 left as I was running/hiking this wash back up to Zabriskie Point. It was midafternoon at this point, the hottest part of the day, and I was very glad it was winter. It was still in the 80’s, and I could not imagine doing this run during the day in summer. I think you would be ok at sunrise, but make sure you have more water than you think you need. I averaged more than 8 oz of water per mile. That doesn’t sound like much for a hike, but as this was a run, 50 ounces of water in an hour is a lot! Speaking of hydration, it is a very important subject and one that can kill you if you aren’t prepared. I have the Ultimate Direction SJ Ultravest, which holds 2 x 20oz bottles in easy-access, hands-free holders on chest straps. I brought an extra collapsible 20oz water bottle that I drank first, and stowed in my back when it was empty. I’m not sure if I have a good pic of my hydration setup in the Death Valley setting. Most of my selfies are in other places. In the near future, I will do a review of this awesome vest and post it here. This is one of the problems with blogging about something a long time after it happens. You can’t go back and get extra shots to illustrate something you write about. 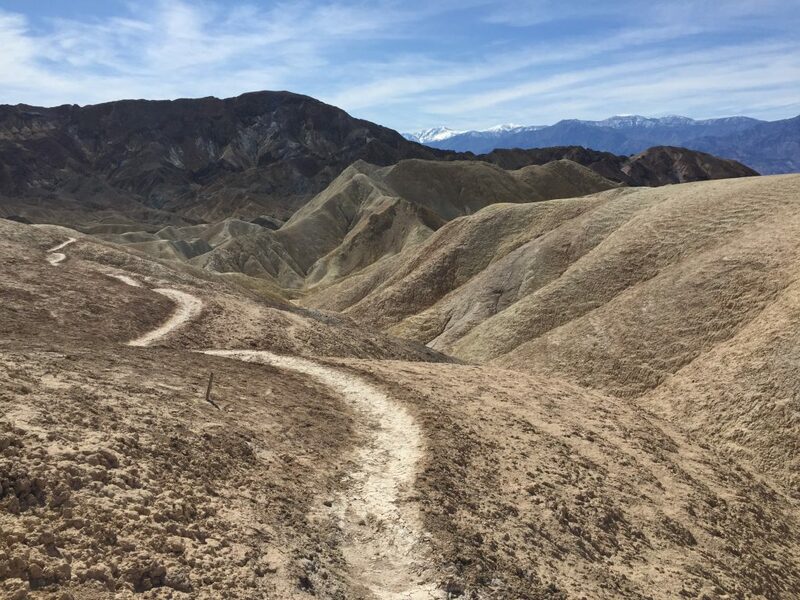 Running down the trail from Zabriskie Point into the Badlands. You can see snowcapped mountains in the distance. Looks refreshing! I hope I didn’t lose too many of my readers on this 3000+ word blog post. It took me a very long time to write, and I will probably edit it quite a few times before I tell anyone about it. If you have anything to comment please do so below. This is one of my first “real” article-level blog posts, and I’m sure I’ll get better in the future. P.S. 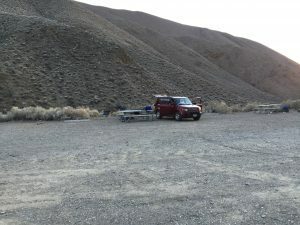 : If you’ve read this far or TL;DR’d looking for the “catch” to the free camping, here it is: it’s way out of the way, and if you want to explore the park, you’ll probably spend more in fuel than you would on camp fees. And you’ll be spending hours each day getting to and from your camp. On the positive side, it is much cooler at 4100 ft vs -282 ft, it’s more scenic, you might have a cool story to tell, and you won’t be surrounded by hulking RV’s.